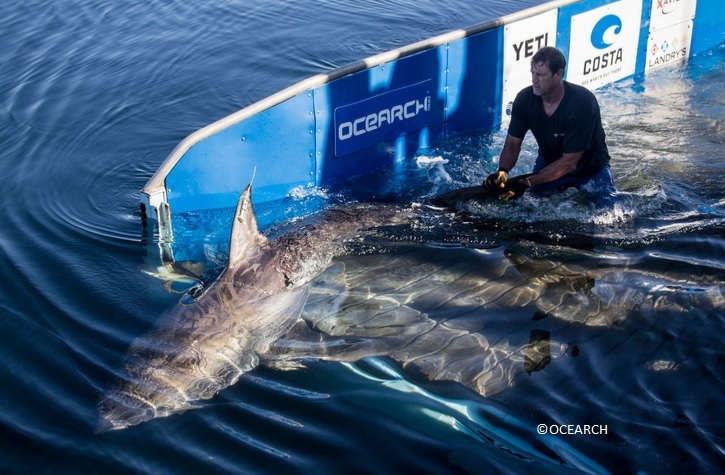 Could Katharine be driving sharks to shore? As Great white shark Katharine heads closer to the Gulf , we actually have a first hand report of another shark encounter off St. George’ Island, Florida. Saturday at around 1:30 P.M. 18-year-old Savannah Lee and her grandfather William Otto were kayaking in 40 feet of water around 150 yards from the beach. They were looking for sea turtles and hoping to spot a dolphin, until someone else decided to pay them a visit. Mr. Otto, a scuba diver for over 30 years, said they were sitting in the kayak when they heard a splash which sounded like a wave hitting the side of the kayak. When they turned toward the disturbance, they realized they had a toothy visitor. Mr. Otto identified the shark as a thresher and estimated it was at least 6-feet-long, but could have been longer. Thresher sharks are known for their long tails used to stun fish before consummation and are normally found hanging out around the continental shelf. Ms. Lee believed the top of the tail was at least 2-feet-long and was protruding around 8 inches above the surface. The shark was tilted on it’s side as it attempted to look at the boat’s occupants. It rubbed its body the entire length of the 10 ft kayak. “It was bigger than I am and its body was at least 16 inches wide,” Mr. Otto said. The two quickly paddled back to the beach, as Ms. Lee was ready to put her feet back on dry land. Could it be possible Great White Shark Katharine’s presence is pushing these deep water sharks closer to shore? Update: June 22, 2014 When returning the kayak today, the shop owner reported a 14 foot tiger shark was caught from the same beach.